Mars has distinct polar ice caps, but Mars also has belts of glaciers at its central latitudes in both the southern and northern hemispheres. A thick layer of dust covers the glaciers, so they appear as surface of the ground, but radar measurements show that underneath the dust there are glaciers composed of frozen water. New studies have now calculated the size of the glaciers and thus the amount of water in the glaciers. It is the equivalent of all of Mars being covered by more than one meter of ice. The belts of glaciers at its central latitudes are shown in trhe image below between the blue lines between the latitudes 300-500 in both the southern and northern hemispheres. "We have looked at radar measurements spanning ten years back in time to see how thick the ice is and how it behaves. A glacier is after all a big chunk of ice and it flows and gets a form that tells us something about how soft it is. We then compared this with how glaciers on Earth behave and from that we have been able to make models for the ice flow," explains Nanna Bjørnholt Karlsson, a postdoc at the Centre for Ice and Climate at the Niels Bohr Institute at the University of Copenhagen. Nanna Bjørnholt Karlsson explains that earlier studies have identified thousands of glacier-like formations on the planet. 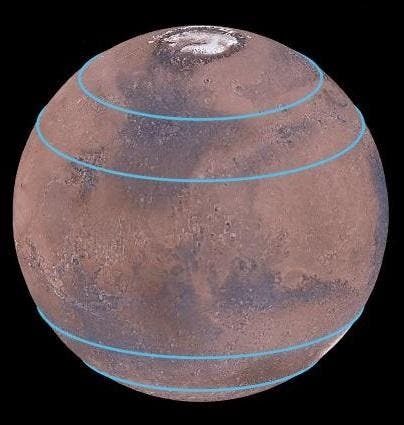 The glaciers are located in belts around Mars between the latitudes 300-500 – equivalent to just south of Denmark's location on Earth. The glaiciers are found on both the northern and southern hemispheres. "We have calculated that the ice in the glaciers is equivalent to over 150 billion cubic meters of ice – that much ice could cover the entire surface of Mars with 1.1 meters of ice. 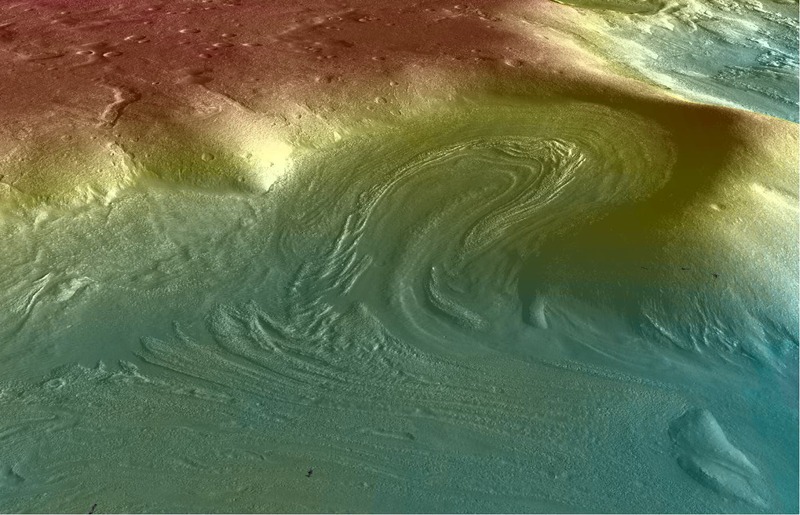 The ice at the mid-latitudes is therefore an important part of Mars' water reservoir," explains Nanna Bjørnholt Karlsson. "Alien Solar Systems Harbor an Average of Two Habitable Planets"